Instigators of Woodford pigtail day and Illuminated Hands performance pottery, these guys are masters of clay fun. With combined experience of over 100 years at the wheel, multiple awards and years of clay under their fingernails: meet Linda, Isaac, Grant, Bec and Kari at the Woodfordia Pottery. Festival evenings, Potters of Woodfordia open a peep hole to passers by, inviting insight into that famous scene from Ghost! Get your Patrick or Demi on! Get your Patrick or Demi on! Dirty those hands and make a pot! This is your opportunity to experience the potter’s wheel. 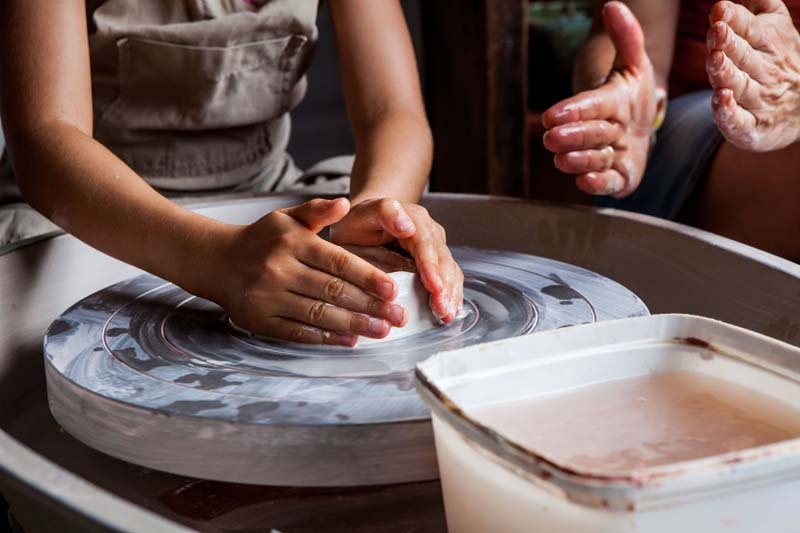 Discover new skills or revisit a nostalgic school encounter: the magic of forming soft clay. Contribute your piece to a giant Woodfordia sculpture with the Potters of Woodfordia.